This Fall Estimation Activity is my go to game for fall and Halloween parties. Kids love guessing how many candies are in the jar and are always on the edge of their chairs, anxious to hear how close their guess is. 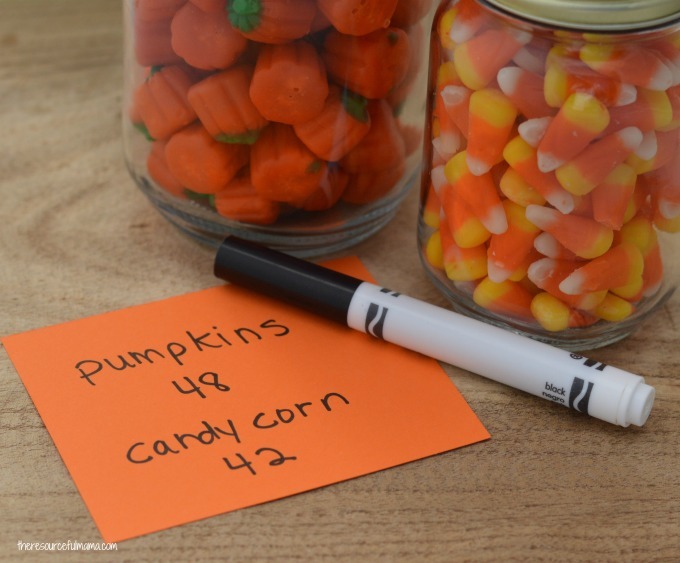 This estimation activity works great as a game for fall and Halloween parties for several reasons. 1. It is super easy and quick to set up. The jars can be made ahead of time. 2. It requires no additional space. I have done estimation games in several classes. The kids stay at their desk and I walk around holding the jars. 3. The supply list is short, inexpensive, and the items can be reused. You can eat or use the candy afterwards for other activities and crafts like these Candy Corn Flowers. 4. It’s super versatile. This estimation activity can easily be used for other holidays and/or seasons by simply changing the items in the jar to match the holiday and season. 5. Finally, estimation jars are a fun and easy way to practice math skills. Kids are practicing a real life skill with this fall estimation activity. We estimate often throughout our days without thinking about it when we are shopping, cooking, giving distance, and much more. I used Candy Corn and Mellowcreme Pumpkins, but there are lots of items you can use as fillers. If you are doing a Halloween party, you could do plastic spiders in the smaller jar and vampire teeth in the larger jar. You can also transition this to another holiday just by changing the filler. For example, you could add conservation hearts and chocolate kisses for Valentine’s Day. You could add green and red pom poms or beads for Christmas. You can set this Fall Estimation Activity up a couple of different ways. I do this activity in the classroom during Halloween parties and follow these steps. 1. Instruct the students to stay at their desk. 2. Give each student a piece of paper and ask them to pull out something to use for writing. 3. 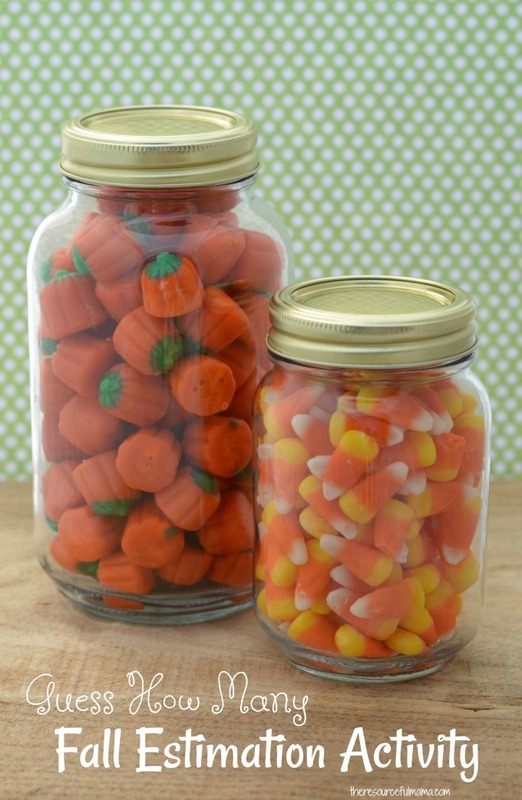 Explain to the students that they are going to estimate (make a thoughtful guess) how many candies are in each jar. If I have two jars, we usually do one at a time. 4. Walk around the room showing the students the jar. 5. Instruct the students to record their guess/estimation on the piece of paper. I have been known to forget how many candies I have so I usually tape a really small piece of paper to the bottom of the jar with the answer. 6. Reveal the answer and repeat with the next jar. You can also set the jars, pieces of paper, and pencils out on a table. Include instructions for kids to Guess How Many. If there is a prize or recognition attached to the game, you will need to collect more information on their paper. This is a great activity. I love your candy choices to make it seasonal!